The enlivening, fresh scent of Lemon Lemongrass Vitalizing Body Milk awakens and invigorates. This fast-absorbing moisturizer is the perfect complement to an active, healthy lifestyle. Formulation: Lemon essential oil and lemongrass extract invigorate and refresh, leaving skin feeling toned and firm. Quince seed extract soothes and hydrates, while jojoba, sunflower and olive oils replenish, fortify and nourish the skin for all-day hydration. This is all natural yet moisturizes without being thick ( seeps into skin) and leaves skin tighter in a natural way! Most fabulous product I have ever used! It is amazing and feels so good on skin! Not enough “moisturizing” for my needs. I mix it with regenerating body...for the nice scent of lemongrass with extra moisture of regenerating body lotion. I love this lotion (Milk). It is so smooth and smells great! I look forward every morning after my shower to smooth it on. I do love this scent. It feels both comforting and cheering on the skin, the texture is almost weightless but makes one feel smooth all over. You do have to like the aroma, however, but I really do. This has such an amazing smell and feels great on my skin. I always feel moisturized after using. So silky smooth on my sensitive skin. I love this product and highly recommend especially if you have sensitive skin. Goes on easily, doesn't feel heavy and the smell is really nice. Lemon lemongrass body milk is light, silky and smells wonderful. It is a perfect summer moisturizer. This body milk is incredible! Unlike cheaper moisturizers I've used in the past, this actually keeps my skin moist for over 24 hours. It really locks moisture in and has the most delicious fragrance of any moisturizer I've ever used. An amazing product! I got this as a trial sample, and it smells divine and goes on like silk. The smell of lemons has an awake sense to it. it's non oily so I can get dressed right away without concern for getting it on my clothes. Very refreshing. Very nice and light body lotion, absorbs super fast leaving the skin hydrated, it smells fantastic. Great product! Has many uses - fun and practical esp. for sensitive to dry skin. Nice aroma too. I just started to use Lemon Lemongrass Vitalizing Body Milk and it is already among my favorite after shower skincare products. Important to me are natural ingredients, absorption and fragrance. This product is a bit pricey, but it comes in a nice glass bottle and a little bit will go a long way. It is absorbed fast and yet many hours later, my skin feels soft, hydrated and nourished. The fragrance is nice, natural and subtle, not overwhelming. This is a wonderful product to use on your own skin, or to share with a friend as a gift. I bought this mainly because I love the lemon scent, as it is very refreshing and makes me smile. The body milk is a nice consistency so that it glides on smoothly and a little covers a large area. I also like to combine the body milk with a squirt of the Hauschka lemon body oil or rose body oil since I live in a dry climate at high altitude. I like this body lotion very much for it light texture, which at the same time provides moisture and nutrition to my skin. Adore the smell! Love this stuff. Suttle fragance and great moisture. Really liking this. I love anything lemongrass because it repels mosquitos without repelling humans, but this is also light and lovely and absorbs quickly. I'm menopausing so thick moisturizers with sweat off fast and make me really uncomfortable. This is a far better option, especially for summer. This is perfect to use in the morning after a shower. Leaves my skin soft and the lemon-lemongrass scent gets one off to a great mood. Nice start to a day! This lotion is just yummy. The way it smells. The way it works. Just all around ROCKS! The Lemon Lemongrass Vitalizing Body Milk is lightly scented, perfect for me as I do not like fragrance that is over-bearing, especially in the summer. The texture is light, but effectively smooths and moisturizes my skin. I apply this lotion after my daily shower, and my skin feels soft and healthy all day. 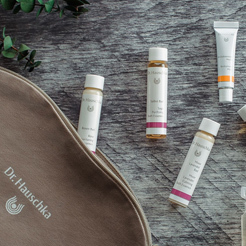 Been using Dr. Hauschka's products for years. However, this one, Lemongrass also helps to keep mosquitoes away from me. Most products have a very subtle refreshing smell; this one’s my favourite. Absolutely recommended . I thought this product was okay. I would recommend this product for moisturizing purposes and potential insect repellent. Lemongrass is supposed to repel mosquitos and other bugs-- although given my recent experiences it apparently does not repel bumble bees! This product may be called "Body Milk", but it is the only thing I use on my face, other than water. I have sensitive eyes, and can't use any other scented products, such as soap or shampoo, but this Lemon Lemongrass Vitalizing Body Milk doesn't bother my eyes at all, and I love the fragrance. Apply evenly and massage into skin. Water (Aqua), Alcohol, Salvia Officinalis (Sage) Leaf Extract, Prunus Spinosa Fruit Extract, Pyrus Cydonia Seed Extract, Glycerin, Cymbopogon Citratus (Lemongrass) Extract, Prunus Spinosa Flower Extract, Helianthus Annuus (Sunflower) Seed Oil, Arachis Hypogaea (Peanut) Oil, Equisetum Arvense Extract, Olea Europaea (Olive) Fruit Oil, Citrus Limon (Lemon) Peel Oil, Fragrance (Parfum), Citral*, Limonene*, Linalool*, Geraniol*, Farnesol*, Coumarin*, Citronellol*, Eugenol*, Daucus Carota Sativa (Carrot) Root Extract, Simmondsia Chinensis (Jojoba) Seed Oil, Algin, Xanthan Gum, Cetearyl Glucoside, Cetearyl Alcohol, Hydrated Silica. To seal moisture into your skin, apply Lemon Lemongrass Vitalizing Body Oil over the moisturizer.